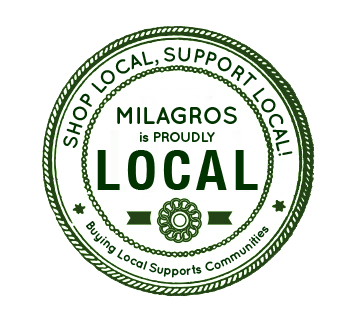 We also offer Milagros as a venue for capsule workshops, like our recent #Photowalkwithliz last February! Are you interested in sharing your knowledge or hosting a capsule workshop in Tagaytay? Email us and let’s collaborate! Let’s make summer a passion-filled one! As December is just around the corner, pls. book your dates early to confirm your preferred dates. Please be advised and plan your #holiday dates accordingly. Thank you for making us part of your #Christmas! Make it a little more Extra! Intimate celebrations can be made a little more extra with us! Enjoy a wonderfully made meal just for two with privacy, some personalized accents and your own violinist serenading you while you enjoy your meal — inquire about our #RomanticMealsforTwo package, which comes with all this and none of the hassle! 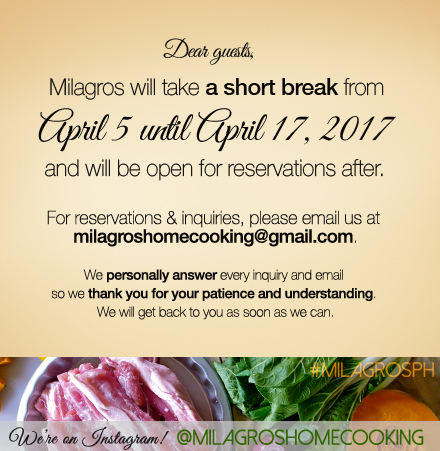 Email us at milagroshomecooking@gmail.com with your full name, contact details and date/time of your intended dining to check the availability of the place. We will get back to you the soonest to discuss any further booking inquiries. Join us for a Photo Walk on May 19, 2018 with @backpackandaway’s Liz Rañola! Learn how to capture stories of your trips, shoot better landscapes and portraits of your family and friends using available light. The fee is P1250/participant, which covers the tour and facilitator fee, as well as our merienda after the walk. Meetup will be at 1pm at Milagros Private Kitchen. There will be a 15-minute grace period for participants to be at the meeting place. To start the afternoon we will have an exchange of ideas and light conversation about photography with the facilitator before we head to Flower Farm for the tour and shoot. After the shoot we will head back to Milagros for merienda and show and tell of photos of the participants from the afternoon’s activity. 1. What are your struggles in taking photos during travel? 2. What are the goals of travel photography? 3. What makes a good photograph? 4. What makes a good composition? 5. How do you light your subject (family members or friends) using natural light? 6. What are good tips and tricks in taking photos in new places? Liz has been a professional events and portraits photographer since 2011, starting out as a wedding photographer at Imagine Nation photography. Her style of photography focuses on use of natural light, candid photography as well as photo journalism.Liz is a world traveller, having backpacked in Myanmar, India, Germany, Prague, Slovakia and the US, to name a few. She has contributed her photos and stories to the Philippine Daily Inquirer and Matador Network. Join Liz on May 19 for a photowalk afternoon here in Tagaytay as she shares her passion, tips and stories on travel photography. Due to the limited slots (12pax only for this session), we need a confirmation via deposit for participants to confirm their slot. Secure a slot now! Thank you and we hope to have you join us on May 19! Learn macramé and create the most iconic of all macramé projects: the Plant Hanger. This workshop will take you through various knots, measuring and cutting ropes, tips on how to customize your plant hangers and different ways to create the top of your plant hanger. Learn to divide ropes into separate sections to work individually as well as create basket structure to cradle plant pot/jar. Session fee is PHP 2,500.00. Only 8 participants will be accommodated for the class. REGISTER NOW! Please contact us by phone (0917.4654617 or 0906.2043248) or email milagroshomecooking@gmail.com (subject: workshopJanuary2017) to register. We will email you the bank details once you register. Please deposit payment & send copy of the deposit slip through email to confirm your registration. Teacher by training, financial literacy advocate by choice, crafter by accident – Gladys Venus Jose learned basic bead work from visiting a Mangyan refugee camp in college. As a grade school teacher in Palawan, she would make jewelry and would sell them through souvenir shops. As a token for helping organize a music and arts festival, she was allowed to attend a class for free. She joined jewelry making class where she learned macramé. A lefty crocheter, Gladys makes crocheted bridal bouquets and enjoys kumihimo braiding as well as loom knitting. With a budding green thumb, she has also facilitated Succulent Dish Garden Making and incorporated water plants in her macramé plant hangers. Aside from macramé workshops, she also facilitates workshops in finance, investments and costing. Check out more of Gladys’ work on her IG @roperepublic, and catch her on our upcoming workshop as she shares her knowledge on creating beautiful customized macrame pieces. We can’t believe it’s the last quarter of the year! Time surely flies fast! Over the past few months we’ve had the opportunity to not only serve you our heirloom recipes, we’ve also been blessed to share in some defining moments in their lives (2 proposals, 2 weddings and even a Renewal of Vow ceremony!) We are happy to share these moments with you and we thank you for making Milagros a part of your special day. Thank you for those who have given us feedback, recommendations and reviews through sites as well as through our Tripadvisor page, these truly make our day! With the Holidays coming up, festive celebrations of Christmas and family gatherings will surely come with it. Check out our new menu options just in time for the busy festive season! For groups of 4 or more, we have hassle-free options that’s sure to make this gathering deliciously memorable! (Please note,we are strictly by reservation, so make sure you have your booking confirmed). here. We will be closed for Nov. 30, 2016, Dec. 25, 2016 and Jan. 1st, 2017, so be sure to order ahead for pick-up dates during the busy holiday season (call/message us at least 5-7 days ahead of your event to ensure availability). Again, we owe it to you, dear guests! Thank you for your support & shared moments with us! 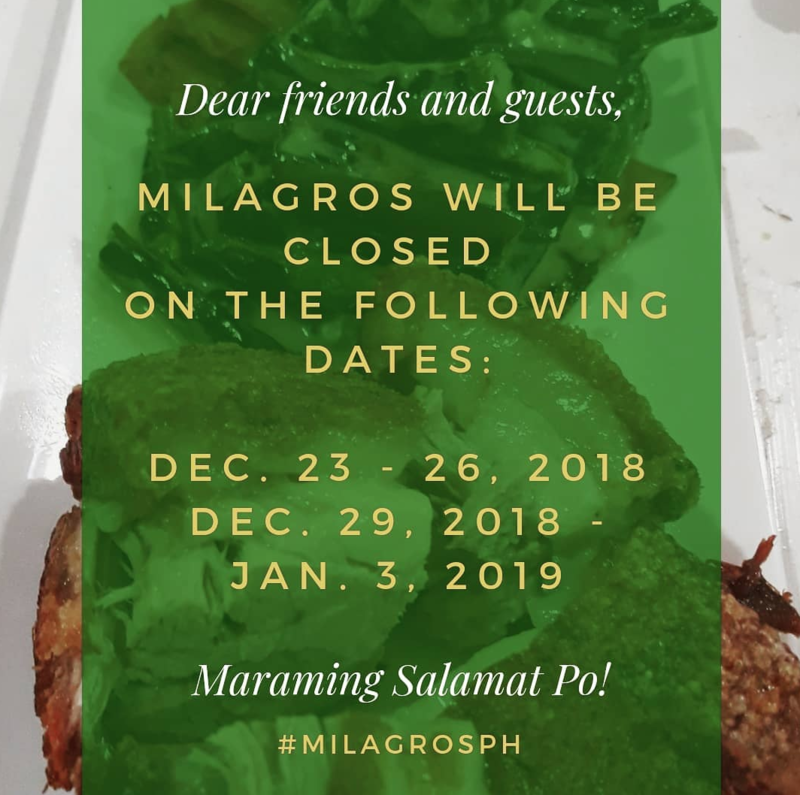 Tag us #milagrosph with your special moments dining here at Milagros, or share with us your mouth-watering food pictures of your favourite dishes from Milagros. We hope to continue serving you delicious, family recipes and make your dining experience truly memorable! Look out for more exciting culinary experiences, especially this November, as we celebrate our anniversary 😉 We look forward to the new Year with you! Hello, Summer is here and it IS HOT! How’s your April so far? New year, New Menu! We’ve worked out a few kinks late last year and have updated our Menu — please do check out our new offerings! We’ve got new Specials for you to enjoy! Summer is time for learning, so why not learn to cook? Wow your friends and family with Spanish fare which will be taught this May 15 at Kusina ni Milagros (KnM). It’s a small class (maximum of 6 participants) so sign up now! Interested parties, please check out the details here. Fancy a special date with your someone special here in breezy Tagaytay? Whether you’re celebrating a milestone, or just out for a weekend getaway, We’ve got some not-your-usual-fare options in our Special Lunch Set for Two. Enjoy dining without the hassle (or lack of privacy). Please note to make your reservations at least 3 days ahead. Have You Checked out our New Menu? Our new menu for 2016 is up! Check out the new items and set menus, perfect for any special event or simply time for bonding with family and friends. Avail of our Special Valentine month Lunch Special! Take the romance level up a notch and celebrate with our degustation lunch this ‪#‎love‬ month! More on our special Menu over here.